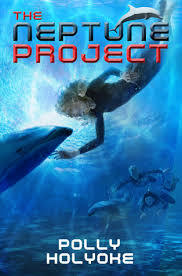 Texas Bluebonnet Award nominee The Neptune Project left me with a funny taste in my mouth, and not just from imagining the fish-flavored power bars the genetically altered children eat as they adjust to life underwater. Overall, the book is an extremely captivating read. Author Polly Holyoke has created a clever new twist on the dystopian novel by setting it underwater. A group of children discover early in the book that their parents allowed them to be genetically altered with fish genes that allow them to escape the Orwellian chaos above ground and create a new world as the first humans to live under the sea. Nere, the book’s protagonist, has always wondered why her eyes don’t see well on land, and why a short run has her wheezing. She finds out when her mother tells her that thanks to some fancy gene-splicing, she’s been growing in readiness for her transformation. Obviously, Nere has some mixed feelings about this. She loves the dolphins she’s been training all her life, but she is still resentful at being a real-life little mermaid experiment. If the book had stuck to that theme, as Nere battles her feelings about her parents and the project and must become a leader to the group of similarly-spliced children as they escape from both sharks and human predators, I would have been thrilled with its inclusion as a Texas Bluebonnet Award nominee. But Nere is also caught in the middle of a developing love triangle between Dai, the loner renegade of the undersea group, and Tobin, the group’s caring and gentle medic. In one scene towards the end, she swims off with Dai for what turns to a session of kissing in the reef. Dai gets a little too rough, and has to break away to chill his gills, and this great read suddenly turns into 50 shades of Bella Swan and Edward Cullen. Being a Bluebonnet nominee means this book is being talked up in nearly every elementary-school library in the state, and therein lies my problem. The love interest sub-plot isn’t necessary for the story, and really doesn’t need to be part of a book targeted to elementary schoolers. A crush is one thing. Getting crushed up against the reef by an uncontrolled kiss is another, and it will keep me from enthusiastically recommending this one to my 4th graders. For older grades, though, the book has lots to recommend, and the Bluebonnet Award committee has put together some great links and resources for students whose appetite for more infomation is whetted — or “wetted” — by the undersea adventure.